Now booking 2019 - think Hershey Park and holiday family get togethers! Welcome to Honalee, located in the storybook setting of Mt. Gretna. (www.mtgretna.com) - To see our amenities click on PHOTOS to Full Size and scroll through all. 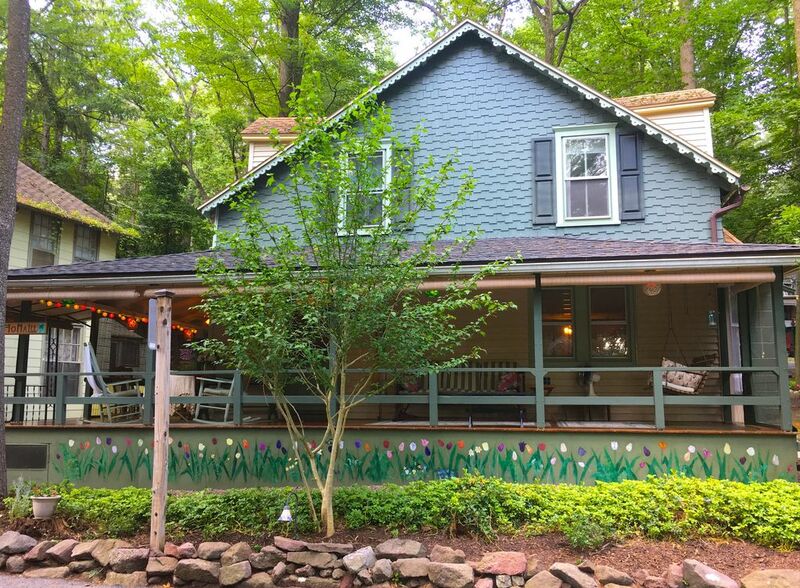 Make our Chautauqua cottage your home base for an unforgettable central Pennsylvania experience. Celebrating over 125 years, Mt. Gretna is a one-of-a-kind destination with a summer calendar packed with cultural and recreational events for the whole family. Come see plays and musicals at the Playhouse and Tabernacle, or walk the Lebanon County Rail Trails. Close to Wolf Sanctuary, the Renaissance Faire, and easy PA Turnpike access. Have a family get together for Thanksgiving or a friends weekend retreat! Mt. Gretna is central to Hershey Park, Amish Country, Lititz, Gettysburg, Carlisle, and Harrisburg. Michael and Laura Charelian live locally in the central Pennsylvania area. Michael is a home remodel and renovation specialist and Laura is a real estate agent working locally. Laura was raised in the area, met Michael in Los Angeles, California, where they married, and lived for many years. They both moved back east with their daughter ten years ago to be closer to family. Michael and Laura finally found the Mt. Gretna cottage they had been searching for and want to share it with a select few travelers and vacationers every year. Welcome! This 120+ year old cottage will someday be our forever home, and it suits our unique needs (parking in Mt. Gretna!) In one family for over 50 years, "Honalee" has been lovingly taken care of, and we look forward to being the future caretakers of this wonderful home. Porch life in Mt. Gretna is a staple and a tradition. We love spending time on the porch swing, either chatting with our neighbors and the visitors who pass by, or just sitting and contemplating the sunset. Wifi available for cell phones, no land line. Window units up and downstairs. Please remember to clean lint trap after every use! smaller tables are also available if you need to seat more than six people. Inviting, charming, clean, cozy, and comfortable! Our family stayed at Honalee over Christmas week while visiting family in the area. We had a wonderful time - the cottage is welcoming, cozy, comfortable, very clean, and conveniently located. We chose to rent through VRBO rather than book a hotel because we have three very young children (ages 6 yrs and under) and wanted something more spacious with a home-like feel, with access to a fully functional kitchen so we could prepare our own meals. The cottage was perfect for our purpose, and the owners were very responsive, attentive, and gracious. A huge bonus (especially during the summer months when the area is packed and parking is tough if not impossible) is the private driveway that can accommodate several cars and walkable location to favorite Mt. Gretna sites. While we weren't able to fully take advantage of the great outdoor space because of the winter weather, the porch and outdoor space are inviting and charming. Thank you for making us feel at home during Christmas (even when we weren't!). We look forward to returning! Thank you so much for the kind words - I'll agree, having ample off-street parking in Mt. Gretna any time of year is a good thing. Because of a recent ordinance, Gretna residents now have parking stickers and are the only ones technically allowed to park on streets. There are public parking lots, but these are not always convenient with children and baggage. We are very fortunate with Honalee to have a great location and parking on site. Honalee is very clean and well kept; the owners have thought of everything. Really enjoyed our stay! Fabulous house! Great location! Great host! Great place! Wonderful house! Well maintained and stocked. Laura was a fabulous host.. even when we locked ourselves out of the house on Friday night! The house is a classic Mt. Gretna house but upgraded to include today’s amenities such as A/C, washer and dryer, great shower ( great water pressure).. The beds were comfortable. The house was very clean. We enjoyed sitting on the front porch on Saturday afternoon and walking around the neighborhood. A great place. We will rent again! Thanks Mary - we strive to do our best for our guests. The ubiquitous porch life is a key part of Mt. Gretna charm, so glad you enjoyed it! This quaint property provided a wonderful backdrop for a mini-college reunion celebrating over forty years of friendship. We loved the accessibility to several shops and restaurants. The property was well stocked with towels, paper products, water etc. The fresh flowers were quite welcoming too! Despite cool temperatures, we spent several hours on the gorgeous porch conversing and enjoying our precious girls' weekend getaway all the more! Walkability in the neighborhood was a huge plus for us as well! We will consider this property for future reunions! Feel welcomed...take in the charm...feel at home and enjoy! Our family of six adults and a toddler just enjoyed at weekend at Honalee - the home had plenty of room for all of us, any amenity you could think of, and extras for our overall comfort as well. The owners here have a wonderful gift of hospitality and that is evident in the special touches provided for their guests. There are some who have a list of rules when you enter their home for a stay, these folks didn't have a list of "do not do this and that", and because of that it's all the more pleasant to stay here. Due to the owner's respect to their guests, I believe the guests then respect the graciousness of the hosts and treat the home accordingly. Special touches, the comforts of home, the helpful information and brochures of what's to do in the area all made our stay one worth recommending to anyone interested in a Mt. Gretna stay. We enjoyed the Porch and Pantry restaurant for breakfast for two mornings. A short walk from Honalee this restaurant provides very friendly service, a relaxed atmosphere (no need to rush through your day, you're on vacation!) and a delicious meal. Hint...they're quite a popular restaurant, so either allow for the wait or get there a tad early and reserve a table, especially if you have a larger party. Honalee is a charming cottage with a wonderful porch. The collage gang ( 4 ladies who graduated from college together in 1972) stayed there in July. From the minute we walked into the cottage we felt welcomed with fresh flowers in many of the rooms and a welcome message on the blackboard! The kitchen was fully stocked with whatever we needed to cook a meal. It was immaculately clean, even the corners in the bathrooms. It is within close walking distance to the Gigger shop and other eating establishments. It rained the whole time we were there but it didn’t matter to us, we had so much fun sitting on the porch laughing, talking and reading . The Mt. Gretna area of central Pennsylvania is within three hours of New York, Philadelphia, Baltimore, and many historic attractions such as Gettysburg. The town of Hershey and Hershey Park are major attractions, as well as Amish country to the south and the Poconos to the north. Mt. Gretna has its own lake with beach and access to wonderful wooded trails. Please see Mt. Gretna web site for extensive list of community events held throughout the summer months. Enjoy an absolutely uniquely American historic village of vintage cottages like no other.